Some villages have all the luck. At least that was the thinking for many residents living near the village of High Rock, in the Wanghin area of Thailand. High Rock has seen an increased amount of attention in recent weeks as visitors have flocked to see for themselves one of the town’s newest residents. 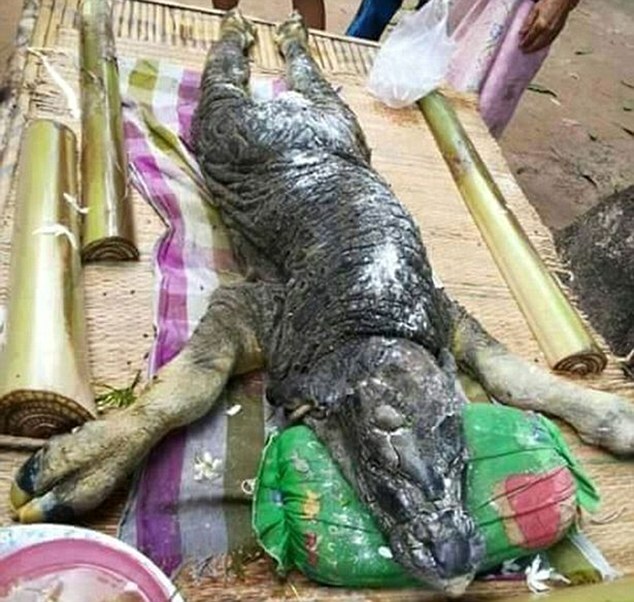 A strange creature, which has the appearance of a hybrid between a crocodile and a water buffalo, was born in the village earlier this month. The owners of the water buffalo, which has given birth to normal calves in the past, believe that the birth of this creature is an indicator of future prosperity and happiness for their family. Other members of High Rock share this view, although some wonder how a creature with such a bizarre appearance could be a sign of good fortune. While the minority held this view, it became a more vocal minority once the ‘Crocalo’ died three hours after birth. Still, even with the animal’s death, locals have gathered to light incense and pray to supernatural forces for more blessings upon the small community of three hundred inhabitants. As for the creature in question, after its death, its body was ritually laid out for worship. In total, the animal is a little over six feet long from snout to hind legs and weighs approximately thirty-four pounds. The head, torso, and back legs are covered in black, shiny scales, while the front two legs are furry. The crocodile-buffalo hybrid has hooves on all four legs and lacks the ferocious teeth that make the crocodile such a fearsome predator. The beast also has a tail, similar to that found on healthy buffalo calves. Speculation has run rampant that this is not a reptile-mammal hybrid. While it is possible for two species to interbreed, such as donkeys and horses, which create a mule, or zebras and donkeys, which create a zebroid, these mating animals share numerous characteristics. 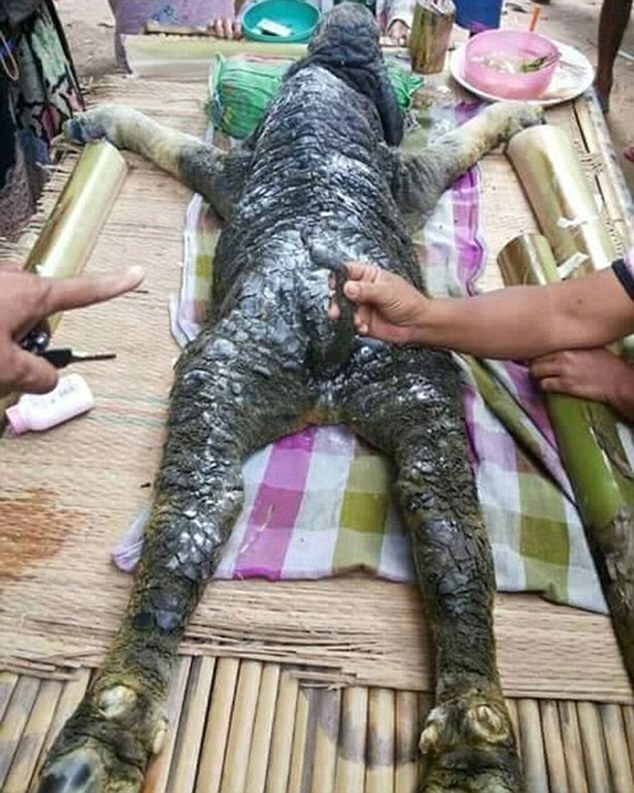 If the animal in question in Thailand truly is the product of interbreeding between a buffalo and a crocodile, it will be the first instance in recorded history of a reptile and mammal having successful mated. Others claim that this animal is simply a buffalo calf that was cruelly burned right after its birth. More information will eventually be available, as scientists from Chulalongkorn University collected samples from the carcass for genetic testing.